Watching the live telecast of the parliamentary debate on the bond scam, the predominant impression I was left with was that the PM has a crisis of legitimacy; the bond scam has blown a hole below the watermark of his incumbency. The SLFP and JVP speakers went for the jugular during the debate and there was blood in the water. Attending the mammoth Nugegoda rally on January 27, 2017 and participating as a speaker who had not only been on the stage and read out MR’s message two years before at the same venue in February 2015 but also been among the handful including Wimal and Udaya who planned that ‘patriotic fight-back/MR comeback’ initiative at a working dinner in January 2015, I noted the expansion of the crowd in 2017 and the sustained, blistering attack on the PM (albeit with some sardonic sideswipes by MR at his successor). The spirit of the huge 2017 rally, both of the speakers and the crowd, was best summed up in Stephane Hessel’s famous phrase and title of his pamphlet, ‘Indignez Vous!’ which translates as ‘Time for Outrage!’ If Nugegoda 2015 was a ‘Time for Resistance’ in the face of the defeat some weeks before, Nugegoda 2017 was a ‘Time for Outrage’. Nugegoda 2015 heralded a political guerrilla war and the uprising of a patriotic political resistance movement. 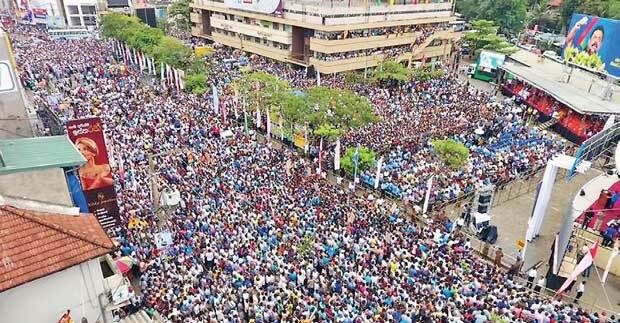 Nugegoda 2017 witnessed a shift in the mood and the correlation of forces due to a deepening of the crisis. From political guerrilla war the Opposition had graduated to frontal, political, social and ideological battle. The patriotic popular–democratic (or populist) movement has shifted from the defensive to the offensive; from resistance to revolt; from guerrilla combat to a strategy of political insurrection. This escalation/radicalization is essentially due to the defrauding of the JO’s legitimate status and political space as the Parliamentary Opposition, the denial of Opposition leadership to Mahinda Rajapaksa-Dinesh Gunawardena, and the installation of the counterfeit Opposition, the TNA. The Parliamentary debate and the Nugegoda rally revealed that within and outside Parliament, within and outside the January 8, 2015 coalition, the PM’s policies, personal style and the aggressiveness of his loyalist UNP hawks have become alienating and polarizing factors all around the political compass. The PM is radioactive; a hate symbol; the target on the back of the Sirisena dispensation, the SLFP and the UNP itself. What has gone wrong within the coalition? Is it that the UNP has treated the TNA, BTF/GTF, NGOs and DPLs rather than the SLFP as its main coalition partners, and the SLFP is teaching it a lesson? The SLFP’s status and self-esteem as that party whose leaders – unlike those of the UNP -- have led the country from 1994 to date, have been affected. Its core interests are threatened by the UNP-NGO-TNA attempt to abolish the executive presidency. Its continued support for the PM is proving electorally expensive as the economic pain and nationalist resentment mount and the UNP becomes a hate symbol among the SLFP’s support base. In my Nugegoda 2017 speech I made three points, speaking to the overall theme of the gathering which was “Peraliya” or “Overturn”: ‘Whom? Why? How?’ Who should be overthrown? What is the reason for overthrow? How can they be overthrown? As I had done ten days before at a forum at the Hilton Hotel on “Two Years of Yahapalana and the way forward in the Third Year”, at which President Sirisena was chief guest, I identified the Ranil-Mangala-CBK troika as a “neoliberal rightwing clique”. The Forbes magazine piece followed the prestigious Hindu which had broken the story that Sri Lanka is to offer the Trincomalee harbour to India.“India, Sri Lanka in talks on port” was the headline of the report by Kallol Bhattacherjee datelined New Delhi, January 19, 2017. “Talks are at present going on between India and Sri Lanka and we hope to offer the Trincomalee port, which is one of the best deep sea ports in the world, to India,” said Mr. Fonseka speaking to The Hindu on the sidelines of the Raisina Dialogue. In Nugegoda on January 27, I warned that the intended giveaway of Trincomalee to India would inevitably be a temptation and trigger for the carving out of an ethnic state in the North and East by the neighbouring power in the context of Indo-US strategic rivalry with China, and the abiding irredentist presence of “ethnic kin-state” Tamil Nadu. “[Chandrika’s] UPFA seems to mistake a strategic alliance with India (highly desirable) with turning Sri Lanka into a ‘mango republic’ or ‘coconut republic’ (equivalent of a Latin American ‘banana republic’) of India. While India’s experienced policy makers and diplomats probably know that relationships are more important than real estate (e.g. US/Philippines), what I focused on at Nugegoda on Friday Jan 27th evening was that the Trinco giveaway attempt itself revealed that the Yahapalana government’s “rightwing junta” was threatening our limited living space on a small island. I reminded the large audience that Prince Gemunu famously slept uncomfortably curled up because of a lack of geostrategic space, hemmed in by the Tamil kingdom in the North and the Indian Ocean at his back, while our own situation will prove even more circumscribed with Trincomalee, Palaly, the Colombo jetty and Hambantota being ceded to foreigners. I contended that the “Ranil-CBK-Mangala junta” constituted an existential threat to the island community which had to be removed. The only exit from endemic political instability, governmental dysfunction and deadlock leading to disinvestment and implosive collapse, is for the President to hit the ejector button on the PM. Sack the captain or the Titanic hits an iceberg and sinks.